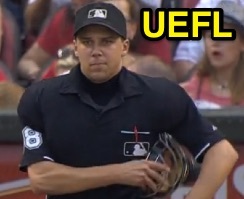 HP Umpire Adam Hamari ejected Reds RF Jay Bruce for arguing a strike three call in the bottom of the 3rd inning of the Phillies-Reds game. With none out and none on, Bruce took a 1-1 slider from Phillies pitcher Aaron Harang for a called second strike followed by a fastball for a called third strike. Replays indicate the pitch ruled strike two was located off the inner edge of home plate and midpoint high (px .950, pz 3.480) while the pitch ruled strike three was located along the inner edge of home plate and midpoint high (px .921, pz 3.621 [sz_top 3.730]), the call was incorrect. At the time of the ejection, the Reds were leading, 6-1. The Reds ultimately won the contest, 11-2. This is Adam Hamari (78)'s first ejection of 2015. Adam Hamari now has 2 points in the UEFL Standings (4 Prev + 3 AAA - 1 Penalty - 4 Incorrect = 2). Crew Chief Brian Gorman now has 14 points in Crew Division (14 Previous + 0 Incorrect Call = 14). This is the 80th ejection of the 2015 MLB Regular Season. This is the 38th player ejection of 2015. Prior to ejection, Bruce was 1-2 in the contest (SO). This is the Reds' 4th ejection of 2015, 1st in the NL Central (CIN 4; MIL 3; CHC, STL 2; PIT 1). This is Jay Bruce's first ejection since June 19, 2008 (Bob Davidson; QOC = Y [Time Out No-Call]). This is Adam Hamari's first ejection since April 29, 2014 (Andy Van Slyke; QOC = Y [Check Swing]).